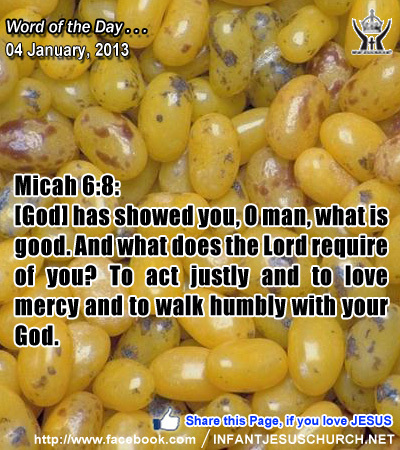 Micah 6:8: [God] has showed you, O man, what is good. And what does the Lord require of you? To act justly and to love mercy and to walk humbly with your God. Heavenly Father, and compassionate God, as we embrace this New Year, help our eyes see what your heart sees. Teach us to hate sin and to be merciful to all who need mercy. Teach us to know truth and act rather, while hating abuse and exploitation. Through your Holy Spirit, stir us to reflect on the great distance between your holy majesty and our contradictory character. Make us wholly your child, we pray, in Infant Jesus name. Amen. 35The next day again John was standing with two of his disciples; 36and he looked at Jesus as he walked, and said, "Behold, the Lamb of God!" 37The two disciples heard him say this, and they followed Jesus. 38Jesus turned, and saw them following, and said to them, "What do you seek?" And they said to him, "Rabbi" (which means Teacher), "where are you staying?" 39He said to them, "Come and see." They came and saw where he was staying; and they stayed with him that day, for it was about the tenth hour. 40One of the two who heard John speak, and followed him, was Andrew, Simon Peter's brother. 41He first found his brother Simon, and said to him, "We have found the Messiah" (which means Christ). 42He brought him to Jesus. Jesus looked at him, and said, "So you are Simon the son of John? You shall be called Cephas" (which means Peter). To call someone a "rock" was one of the most compliments in the ancient world. The rabbis had a saying to when God saw Abraham, he cried out "I have discovered a rock to establish the world upon". Through Abraham God discovered a nation for himself. Through faith Peter grasped who Jesus truthfully was – the Anointed One (Messiah and Christ) and the only begotten Son of God. The New Testament describes the church as a religious house or temple with each member joined together as living stones. Faith in Jesus Christ makes us into rocks or sacred stones. The Holy Spirit gives us the gift of faith to know the Lord Jesus individually, power to live the gospel faithfully, and guts to witness the truth and joy of the gospel to others. The Lord Jesus is ever ready to illustrate us to himself. Do we seek to produce in the knowledge and love of the Lord Jesus Christ? Loving Infant Jesus, fill us with the power of your Holy Spirit that we may grow in the knowledge of your great love and truth. Let your Spirit be burning in our heart that we may happily seek to do your will in all things.